Lately we’ve been literally attacked with a lot of hit titles to play during the holiday season and more are constantly coming out from different game developers. And the GPU makers have been pressed a bit in releasing a lot of new driver updates with fixes and improvements to make things work as they should or to bring better performance for the gamers. 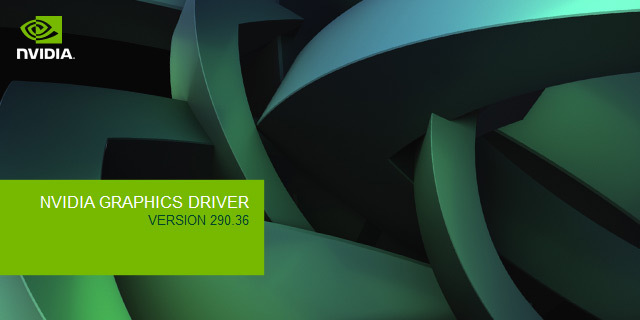 And today comes a new beta driver for the owners of Nvidia-based video cards in the form of driver version 290.36, the first release from the R290 series of drivers. This beta driver brings some new features and a lot of fixes, but as usual I’ll focus on what is new regarding stereoscopic 3D support and you can find the full release notes here in PDF format should you be interested in all the details. The new beta driver has an interesting new feature for 3D Vision, it adds support for 3D Vision over the native DisplayPort 1.1 connection available on the new BenQ XL2420T and BenQ XL2420TX monitors (supporting 3D Lightboost technology). These are apparently the first 3D Vision-ready 3D monitors with DisplayPort available, so Nvidia has also found a reason to add support for 3D Vision to work over DisplayPort as well. Previously DisplayPort was only used together with active adapters to convert it to Dual-Link DVI, mostly for output from laptops that did not have DL-DVI interface, but now you should be able to directly connect one of these BenQ 3D monitors and use it in 3D mode. After playing I cannot disable 3D mode no matter what I try, including pushing the button on the emitter, disabling stereoscopy in the control panel or running the setup wizard again. There also seems to be a sync issue. I have two pairs of glasses and the image through both seems to quickly cycle in light intensity. It was not particularly noticable when playing Skyrim, but looking at a white background through the glasses it is very apparent. It would be great if you’d mention what these complaints actaully are, or at least give us links to them. On a somewhat unrelated note, does anyone know why every time I update the drivers, I have to set all of the stereoscopic settings on the control panel again? I just got my Asus vg278h 3d minotor that I’m using with my alienware m17x r3 3D. I have a DL DVI adapter 330hz made for full 1080 3d… This is so that I can output to my monitor through minidisplayport. With the 285.79 drivers the 3d on the monitor works fine. Once the 290.36 drivers are installed, which now have support for displayport, the 3d on my monitor has a twitch every 2-3 sec. and a strange noise now that coincides with the twitch. The noise seems to come from the speakers. Strange stuff… I hope we will still be able to use the DL-DVI adapter to output to a monitor in future driver releases. I suppose this is just another bug in the beta driver and is not related to the addition of DisplayPort support for 3D, but I may be wrong. I don’t think that native support for 3D over DisplayPort should be influencing in any way people using DP to DL-DVI adapters. Where in the nvidia forum can I mention this issue to one of the tech people?? I’m a little new to all this stuff, thx for the help.